So, you want to publish a book. Given that you’ve written one, that is an admirable goal. You should share with friends and family – and thousands of strangers – what you’ve created. Why not? We are called to share our talents, and to help where we can. In recent months several people have asked me about the process of book publishing in today’s new normal of ebooks, print-on-demand, and audiobooks. After rejections from what I’ll call “New York,” I found – through my network – independent publishing. As I wrote in a previous blog post, the dominant e-reader Kindle has revolutionized publishing like nothing since the Gutenberg Press, and fellow author and veteran Jeff Edwards of Braveship Books, who is an award-winning writer of remarkable success, walked me through it. Here are the steps I’ve used in my journey as an author/entrepreneur. Beta Readers We remember the teachers (instructors, flight evaluators) who pushed us. You want your beta readers, readers who are going to give you a “sanity check,” to push you. While there are always exceptions, your loving family members are probably not good beta readers. You want friends/professional associates you can trust to give you that constructive criticism we all crave. In my techno-thriller genre – with readers who cannot wait to catch errors – I need the beta reader to catch them first, but also to suggest alternate story outcomes and question the techno-details. Editor or beta reader – which comes first? Not critical, and they can occur simultaneously. Once edited, if a beta reader (or me) makes major changes, I’ll use my judgment if the changes need Linda’s eye. For the editor and beta reader, my job is to get them the best possible manuscript from which to work. Polish, polish, polish. Cover Design We’re in the home stretch now, about a month from publishing, and the book needs a cover. This is also the subject of a previous blog post, but suffice to say I used 99Designs. I held a “contest” to solicit cover designers from around the world, giving them a basic run-down of my novel and general ideas for a cover. Off they go, and they design covers for Kindle, Trade-paperback, and audiobook; all different. They are pros, and they know to allow space for the ISBN bar code, the spine, back-cover metadata, etc. 99Designs allows you – and people you invite – to rate covers and work direct with the designers for changes. Another fascinating process, and in the end you declare a winner, 99Designs releases the prize money to the designer and you, the author, have rights to the cover you purchased. This process took me 2-3 weeks each time…the final decision is tough. Metadata Of warfare, Clausewitz said “…everything is simple, but even the simplest things are difficult.” Metadata is the “stuff” in the book that is not part of the manuscript. The author bio and back cover blurb are two examples. (The acknowledgments section is part of the manuscript.) Like everything, this needs some thought to make the most of each word in this precious space. Have them ready for when you enter them; more on that in a minute. Formatting There are two types of formatting; PDF and MOBI. A trade-paperback, an actual book you can hold, uses the PDF format. Most of you could plow through that, right? Well, a professionally done book requires the right number of pages, and logical page breaks, etc. Your first page needs to be blank – because the inside front cover is blank, right? For Kindle, a MOBI zip-drive is required. Jeff and Braveship do this for me, after we’ve both given the manuscript a final scrub, and when complete I have the formatted files. Uploading into CreateSpace and KDP This takes me about 45-60 minutes each on the CreateSpace and Kindle Direct Publishing accounts I created. 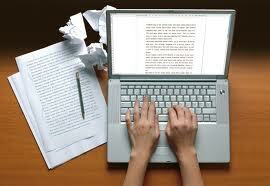 Both methods have a step-by-step process that guides the author. Enter your ISBN, enter your genre, enter your cover. For your trade paperback, do you prefer white or cream colored paper? I guessed “white?” until Jeff said no – cream is easier to read from. Cream it is, no argument. You enter your metadata and answer various questions in the process until you come to the last box: Publish your book. Once you click on that, it is on Kindle or available on CreateSpace within 24 hours, and all of this is at no cost to you. For CreateSpace, they ask if you want an electronic or trade-paperback copy to give one last look. I choose the hard copy which shows up at my door days later. Mistakes that are found are corrected, reformatted, and re-entered. Once complete, the book is “live” with a publishing date. Promoting After I published Raven One, Linda told me I just signed up for a new “job.” For those of us who approach this from a professional standpoint, promoting and marketing is an effort and there are many great books and resources on how to do this. Perhaps a future blog post, and I’m still learning. Frankly, it was through my promotion efforts that Tantor Media found me and offered an audiobook contract. Before that of course, the manuscript was written, cut, sanded, and polished in careful detail. For less than five dollars people can have my novels delivered to their Kindle App, and for not much more to their Audible App. Less than 5% of my readers prefer a good old-fashioned book to hold, and CreateSpace (which has several print factories in the United States) prints one book (or whatever ordered) and ships it to the reader’s door. 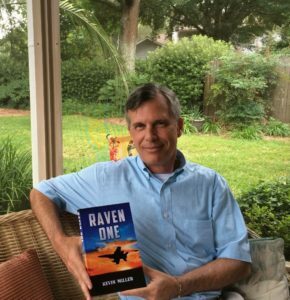 The photo below is of me three years ago with the proof copy of Raven One, which now has a new and improved cover. Thousands of hours of effort went into that, and in my own “new normal” of diverse business endeavors the effort is well worth it. If you’ve got a book in you, publish it. It has never been easier. Thumbs up to you Skipper. I’m a former Jar Head airplane driver about twelve or so years older than you. I’m just completing my opus based on my late Vietnam days. I’ll be down loading your books and I’ll give you a review afterwards.